After homeschooling for 8 years, I’ve yet to find a Bible curriculum that we all just LOVE. During the early years, I’m very happy reading Children’s picture Bible stories. After that, I’ve found things that work but nothing I’d sing from the roof tops. Grapevine Studies changes that. Grapevine Studies is a method of Bible Study which uses drawing stick figures to aid in memory. Young children trace the stick figures, while older children read the bible, draw what they are learning, and then review past lessons. The curriculum can be used by the whole family- ages 3 to adult! Check out this information about the levels and sample pages. I received The Birth of Jesus: Multi-Level for this review. 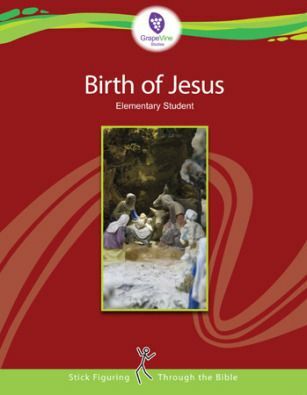 This book teaches about the birth of Jesus in 5 weekly or 24 daily lessons. The 5 weekly topics are: The Announcement, The Birth of Jesus, The Proclamation, The Wise Men & Herod, and Final Review. This book starts with teaching the timeline of Jesus’ birth in stick figures. I think this is such a great tool to help remember the order of events, especially for my artistic and visual learners! I am really looking forward to seeing how this method works with a topic we don’t know as well. The story of Jesus’ birth is so familiar to my children, that much of it was already memorized. I’m already trying to narrow down which study we will do next! I love this chart for deciding where to start with Grapevine Studies. Be sure to buy both the student book AND the teacher book when buying Grapevine Studies curriculum. Sometimes I buy teacher manuals, only to feel like I wasted my money- that is not the case here. The Teacher Manual contains all the important details and great lesson plans. The teacher manual suggests a white board and markers for teaching. I got a small 8×11 dry erase board for portability, but I also found blank paper on a clipboard worked when we schooled away from home. Lessons include a Bible verse (or section of verses) to read aloud. Next you’ll discuss the material with your students, using the talking points provided in the teacher’s manual. Next draw stick figures to represent the new material. New vocabulary is presented with the recommendation of looking it up in a Bible dictionary. Each new stick figure drawing represents a verse or small section of verses in the Birth of Jesus. The lesson ends with review questions to check understanding. This is now my children’s favorite subject. We do the shorter daily lessons rather than the weekly. My kids always beg to do more, but I find they retain more of the new information by spreading it out over the whole week. Also, I prefer to stop teaching while they are still enjoying the subject, it keeps them excited for the next day! With 5 weeks or 24 days of lessons, I think that this Birth of Jesus study is perfect for Advent! You can either teach the 5 weekly lessons during Advent, or teach the lessons as a 24 day count down to Christmas! My family loved this study so much, that we plan to redo it during the 24 days before Christmas too! Read more reviews from The Schoolhouse Review Crew by clicking below. You’ll find more opinions on The Birth of Jesus and other Grapevine Studies too! Connect with Grapevine Studies on Twitter, Facebook, Google+, and Pinterest. They are also on Periscope as @Grapevine Studies.